Playtech blackjack strategy and blackjack rules for successful online blackjack gambling. The object of blackjack is for the total of your cards to be closer to 21 than the dealer’s cards, without exceeding 21. In blackjack, aces count as either 1 or 11, face cards as 10, and number cards as their face value. If you receive an ace and a ten-value card as your first two cards, you have blackjack and win one and a half times your bet (if you bet was 10, you receive 25). If the total value of your cards is closer to 21 than the dealer’s, you win as much as you had wagered (if your bet was 10, you receive 20). If the total of your cards is more than 21, you “bust” and lose your bet. If you and the dealer have the same card total (17 and up) neither of you win and your bet is returned to you in a “push”. Blackjack beats a score of 21. The dealer will not check his hand for blackjack in any case. If the player doubles and the dealer’s first card has of value of 10, and the dealer gets blackjack, the player loses only the initial bet. If your first two cards have the same point value, you may split them into two separate hands by placing a second bet equal to the original bet. Then you proceed to draw cards. You may draw as many cards as you like on each split hand, but if you split two aces, you receive only one additional card for each ace. If you split two aces and one of your hands totals 21, it is counted as 21 and not blackjack. 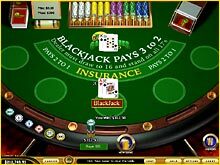 Insurance is considered to be a game of its own within blackjack. It allows you to try and protect yourself when you think that the dealer may have blackjack. When buying insurance, you place half of your initial bet by pressing the Insurance button. If the dealer does have blackjack, you are paid 2 to 1 on your insurance bet. If the dealer doesn’t have blackjack, you lose your insurance bet. Click on chips in the lower left corner of the screen to increase your bet. Every click on a chip increases your bet. Every right click on a chip removes it from your bet. Use the Hit, Stand, Double, Split and Insurance buttons as required. If you want to play another round, select New Game. Then place a bet as described above and select the Deal button, or select Rebet to place the same bet as in the previous round. Double the wager and receive a third card. Draw no more cards and start the dealer’s turn. Protect your bet for those instances when the dealer may have blackjack (see Rules for more info). Begin a new game round. Place the same bet as in the previous round and deal the cards. Skip your turn when you are playing in Multiplayer Mode. Split one hand into two separate hands. See the dates, bets and results of your previous game rounds. To chat with other players (in Multiplayer Mode only), select this button, type your message and then click this button again (or press enter). Open the Options dialog box – see the Options section on the casino site. Press this to exit the game and return to the lobby. You can not exit in the middle of a game round. Tab between the buttons on the screen. Click the button that is currently highlighted. Place your previous bet (same as the Rebet button). Raise your bet. 1 raises the bet by £1, 2 by £5 etc. Exit the game and return to the lobby. Note: If you are disconnected from the Internet in the middle of a game, re-establish your Internet connection and log back into the casino. You will be directed to the game that was interrupted automatically so you can continue playing. Key: Y Yes, Split the pair. N No, Don't split the pair. D Double if allowed; If not, hit. Ds Double if allowed; If not, stand. Tip#1:If your hand adds up to 8 or less, always Hit. Tip#2:If your hand adds up to 9, 10 or 11, always Double Down. Tip#3:If your hand adds up to 17 or more, always Stand (unless you have an Ace). Tip#4:Stand on all totals of 13 or higher if the dealer is showing a 2 through 6. Tip#5:If you’re dealt either Ace-8 or Ace-9, always Stand. Tip#6:If you’re first dealt two 8s, always Split (unless the dealer shows a ten-value card). Tip#7:If you’re first dealt two Aces, always Split. Tip#8:Don’t Hit on a possible bust hand (12 or higher), if the dealer’s showing 6 or less. Tip#10:Stay on counts of 12-16, when the dealer has 2-6 up. Tip#11:Split 9s, if dealer’s up card is less than 9. Tip#12:Never Split pairs of 4s, 5s or 10s. Tip#13:Hit all totals of 12 to 16, provided the dealer is showing a 7 through Ace. Now you are ready to play blackjack online at Playtech Casinos.